"Arkham Asylum" Limited Edition Hand Painted Cel issued in 2005. Limited Edition 91 of 100 produced. 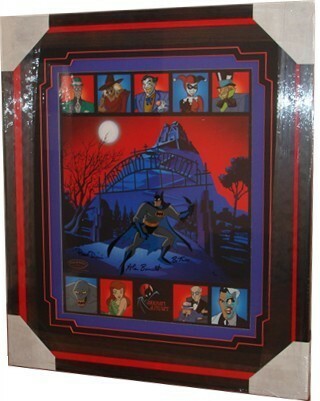 signed in black marker by Batman producers Alan Burnett, Paul Dini and Bruce Timm. Double mounted and framed in a black framed with a red inset to compliment the cel. Comes complete with the original certificate of authenticty from Clampett Studios.